keep track of the number of pulls of the lever and the amount of rewards we have received from that lever. For example: 20% of the time, we choose a lever at random. The other 80% of the time, we choose the lever that has the highest expectation of rewards. In computer science, a greedy algorithm is one that always takes the action that seems best at that moment. So, an epsilon-greedy algorithm is almost a fully greedy algorithm – most of the time it picks the option that makes sense at that moment. It’s simple and easy to implement. It’s not as affected by seasonality. Optimum strategy for maximum successes. No requirement for predetermined sample sizes or other parameters. Codifying the process arguably makes ad-hoc alterations (p-hacking) less likely. Higher levels of significance become practical. The test can incorporate prior knowledge or risk assessment, via the choice of the initial sampling weights. Sampling ratios must be adjusted. Google Analytics content experiments already run multi-armed bandit tests for you, but for other tools you may need to use acalculator and update the sampling ratio yourself. Convergence is slower relative to total sample size. A fixed 50/50 sampling ratio aims for the fewest total samples, whereas multi-armed bandit aims for the fewest total failures. AB: versions that aren’t performing as well continue to receive the same amount of traffic as the versions with a higher conversion rate. 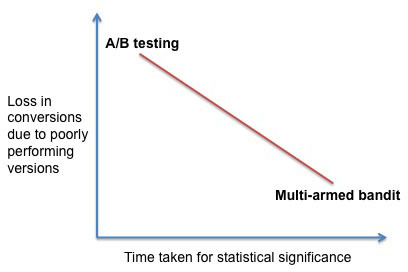 comparing A/B testing and multi-armed bandit algorithms head to head is wrong because they are clearly meant for different purposes. 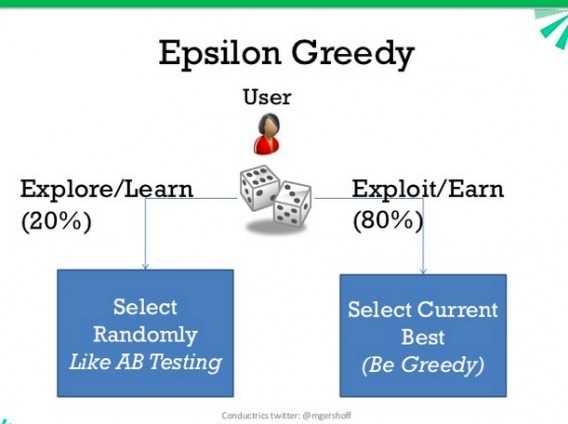 A/B testing is meant for strict experiments where focus is on statistical significance, whereas multi-armed bandit algorithms are meant for continuous optimization where focus is on maintaining higher average conversion rate. If one of your variants is performing so poorly that business goals are threatened, of course you’re going to want to shut off this variant. Similarly, people will often start variants with low traffic allocation and then increase over time (ramp-up). Finally, sometimes people change midway through a test. All three of the above can distort the results: For A/B testing, the test results are representative of the entire testing time and, that is, in equal parts. If you change the traffic this leads to certain time periods being over- or under-represented. Shutting off a variant in the middle of the test has the same effect. If the content of a variant is changed, the test result will be a weird mixture of different hypotheses and concepts that finally no longer provides any insight at all. Here we need to find a healthy balance of scientific rigor and validity & practical business concerns. If a variant is shut down as early as the first few days after the start of the test, it is recommended that the test should be started again but without the variant. In this case, the loss of time is not too high. 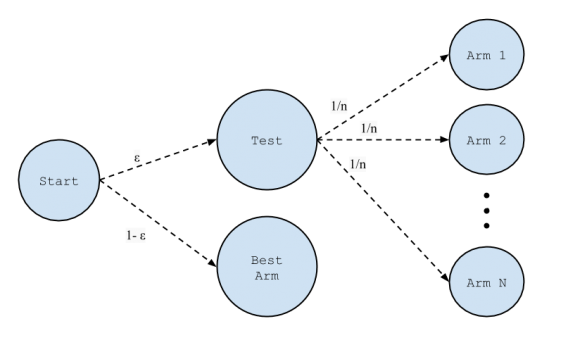 Before you change the variants during the test, better to start a new test and test the adapted variant against the control. If you change the traffic to a higher level from day to day, make sure that you cover a sufficient amount of time with the maximum desired traffic quantity, whereby the traffic remains stable across the time. example: 3 weeks of promotion, to maximize sales, MAB is used. Not great for iterations and learn. In the long run, always exploring still wastes traffic on losing arm. Why not stop the MAB when done? MAB needs more traffic to reach statistical significance, more so when delta is small, vulnerable to seasonality/time cycle etc: may wrongly allocate traffic to worse arms.